I tested out some seriously sticky foods on The Non-Stick Kitchen Foil from Bacofoil®. I received the Bacofoil® Non-Stick Kitchen Foil and a contribution towards the cost of this post, and thank Bacofoil® for their support. I've had more than a few foil nightmares over the years. One thing. It sometimes rips when I move the food around with my tongs and then the oil or fat trickles down underneath the foil and dirties up the tray underneath, completely making the whole point of using the foil pointless. Ugh. Another. Food - especially sticky food - sticks to the foil, and I can't get it off. 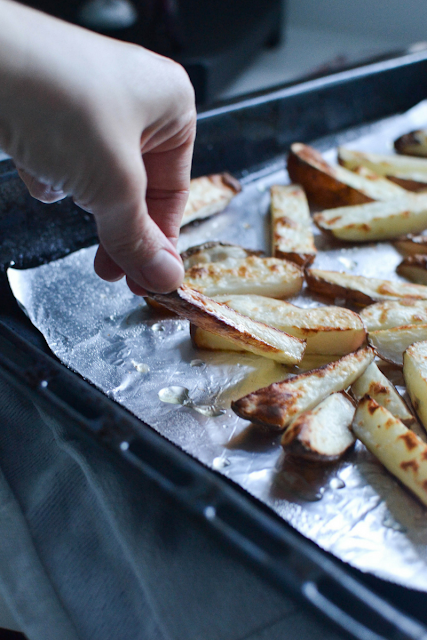 I've had people round for dinner picking bits of shiny foil off their oven chips that I missed. Not good. So when I was asked - challenged, actually - to test out Bacofoil® - The Non Stick Kitchen Foil on some sticky foods, I said yes. The idea, they say, is that this foil is different to the regular supermarket foil because it has a special BacoLift® surface - this is found on the non-shiny side, which is the side your food sits on, to avoid all the sticking. Right. Well, we'll see about that. The first thing that came to mind was sausages. Sticky ones, with honey. And mustard. That would be a good test, because I've often had to peel stuck-on sausages from regular foil, let alone caramelised honey and mustard seeds. 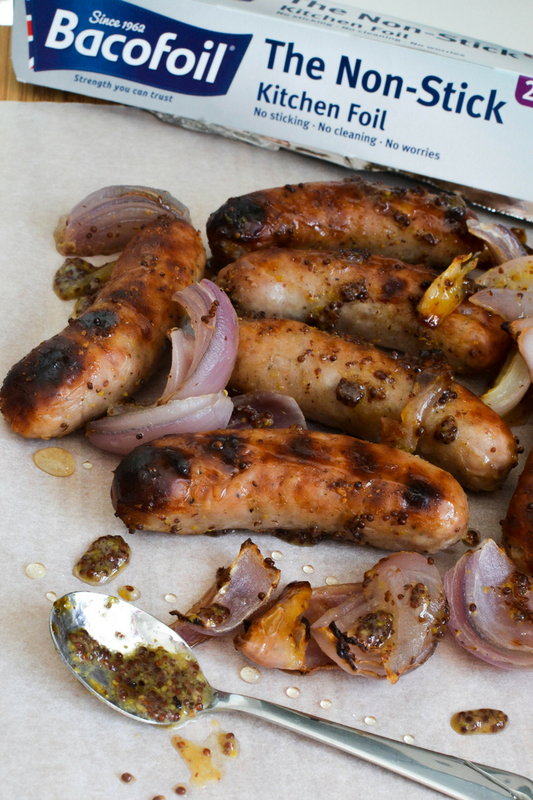 I mixed up 2 tablespoons of runny honey and 1 tablespoon of wholegrain mustard in a small bowl, tossed the sausages in it, with some chopped red onion for good measure, and then spread it all out on a foil-lined baking tray, and added a pinch of salt. Bacofoil® said that you didn't even need to add oil. Ooh, this would be good. So I plonked them on the tray and cooked them - dry, just in their marinade, for 25 minutes. I have to say I was a little bit anxious, as the aroma of sweet, sticky sausages wafted out from the oven. The moment of truth came when I needed to lift the sausages off the foil. I peeked into the oven, placed the tray on a trivet and lifted one off with my tongs. And there was no sticking. Here are the photos to prove it. 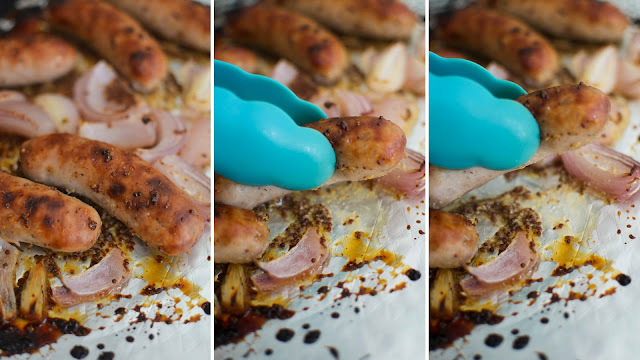 You can see there are no stuck-on marks and the sausages just lifted up off the foil. With no oil. And loads of caramelised honey. I was actually really surprised. The foil really did hold up well and didn't rip either, as I moved the onions and sausages around to serve them. But I couldn't leave it at that. Too many memories of guests picking out foil pieces from their teeth. I told the girls they were having chips for dinner and again, I rolled out the foil. I used much less oil than I usually would, giving them a very slight slick before going in the oven. Once again, no sticking - the chips lifted off, browned and crisp, straight from the foil. And it didn't rip either, as I tossed the jagged, spiky chips around. Both times, washing up was just a quick rinse and it was done. No scrubbing off burnt oil or bits of food - or caramelised honey! - from the tray that had stuck on or seeped underneath. Just a few splatters of marinade on the foil, but no food stuck to that foil. Bacofoil® also make Non-Stick Baking Paper, which also has a non stick surface - and I've been using it to line my brownie tins and loaf tins, and I've found this really works, too! Definitely go check it out, along with the foil. I'd find it hard now I think to go back to regular supermarket foil now I've tried this. 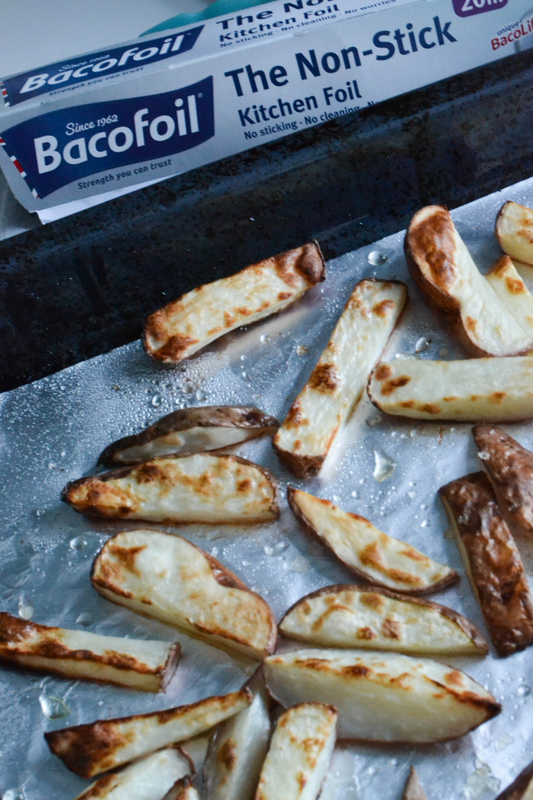 Why not try the Bacofoil® The Non-Stick Kitchen Foil out for yourself? Teriyaki chicken? Barbecue ribs? Vegetables roasted in honey? Find out more at the Bacofoil® website.